While Nvidia is already promising a huge surprise at Gamescon 2018, a new leak from China could be taking away some of their thunder. 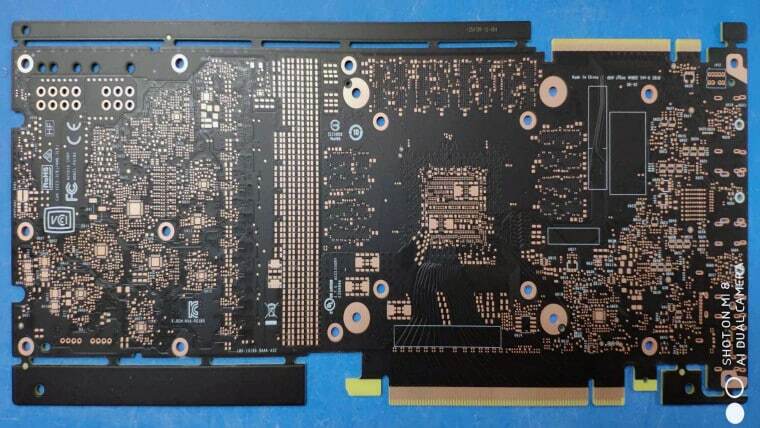 A user from the Chinese site Baidu posted two photos of what could be the beginnings of a new Nvidia GeForce 2080 card, the rumored successor to the very popular 1080 line of graphics cards. According to an analysis by VideoCardz, there are 8 places for RAM chips indicating 8 or 16 gigabytes of memory, and it’s powered by a 10-phase VRM and 6+8 power pin connectors. The logo on the board indicates that is most likely a reference design. The GPU area is actually smaller than other cards, indicating that it could be utilizing the new GV104 chip, which is something else we have little info about at this time. Of course, the new power pin connectors is one of the many reasons insiders believe this could be for a new card. Since the card design doesn’t match pretty much any other design out there, and then on top of that the GPU area is smaller and the power is different, many people believe this is, in fact, a new card design for a new GeForce card to come to market. Once you add this to the idea that Nvidia is already planning a big announcement, and I think you see where I’m going with this. On top of that, the 1080 series has been out for quite some time now, and many in the industry believe that Nvidia is due for an upgrade to its video cards. Sure, they 1080 series are amazing cards, and even with a new generation will remain powerful cards for quite sometime, but that doesn’t mean that the company isn’t due to continue its march forward in graphics card design and power. This has all created a perfect storm of users and industry insiders alike speculating on what the new card could bring. As always it raises more questions than it answers, and with Nvidia remaining quiet, everything you read about new cards today are merely rumors and speculation. Maybe they will clear some of that up at Gamescon, but who knows? What do you think about these latest rumors? Do you think that Nvidia could be close to releasing a new generation of video cards on the market for gaming laptop fans or are we only looking at small improvement to the 1080 series here? Is it time for a new Nvidia card or should Nvidia keep the 1080 series going for a little longer? Tell me your thoughts about Nvidia and the state of gaming in general in the comments below.